1. The holidays for the banks are declared as per? 2. In the banking business, when the borrowers avail a term Loan, initially they are given a repayment holiday and this is referred as? 3. Regulator of Micro, Small and Medium enterprises in India is? 4. A worldwide financial messaging network which exchanges between banks and financial institutions is known as? 5. The term “Smart Money” refers to? 6. The maximum deposit amount insured by DICGC? 7. With reference to a cheque which is the ‘drawee bank’? 8. In which of the following fund transfer mechanisms, can funds be moved from one bank to another and where the transaction is settled instantly without being bunched with any other transaction? 9. Bad advances of a Bank are called? 10. By increasing repo rate, the economy may observe the which effect? 11. In India, one- rupee coins are issued by? 12. Fixed deposits and recurring deposits are? 13. 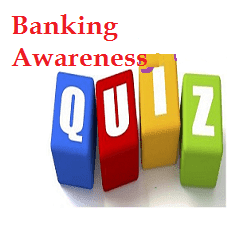 When a bank returns a cheque unpaid, it is called? 14. What is ‘DMAT Account’? 15. When the rate of inflation increases, ___? 16. Banks in India are regulated under? 17. Banking sector falls under which of the following sectors? 18. ASBA scheme is related to the purchase of? 19. The ownership of public sector banks rests with? 20. If a cheque is post dated, then bank on which it is drawn will?